Most people probably have never heard of the Dugong, and most likely will never see one, either. These manatee-like marine mammals still deserve to be left alive. Their habitat, the warm waters of the Indian ocean and the Pacific, is becoming more and more unsafe for them. Especially off the coast of Japan, where only a few of these giant vegetarians live, their lives are threatened. “Henoko Bay is the home of the last remaining Dugongs in Japanese waters. It is estimated that there are as few as a dozen left in existence. We understand that the concrete slabs have already started being dumped into the Dugong’s primary habitat. 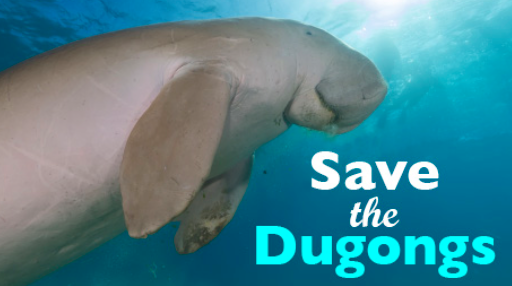 We urge you to intervene and halt further construction until a sustainable solution is found which guarantees the survival of this last group of IUCN red-listed Dugongs and protects the coral reef and the Dugong’s seagrass food supply.